Our hotel is perfectly located for business or leisure. We are less than five minute drive from city centre. 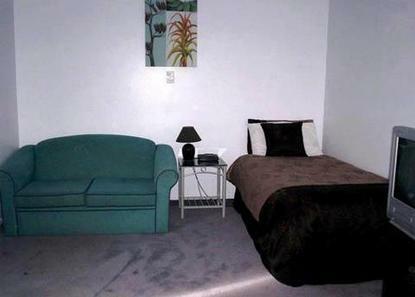 We offer a choice of studio, one and two bedroom rooms sleeping from two to seven people. Our 14 rooms are spacious and light with a modern contemporary feel. All rooms have a queen bed with electric blanket, double spa bath/shower, or shower only, fully equipped kitchens, sky TV, fridge, ironing facilities, and hair dryer. Wireless broadband Internet is available throughout the hotel. Our property has an outdoor swimming pool, barbeque area, cot, and a high chair available for a baby. We serve a choice of continental and cooked breakfasts, delivered to your room.Front Desk Hours: 7:00am-9:30pm Mon-Fri. 8:00-8:00pm Sat-Sun and Public Holidays.